NBC Nightly News host Lester Holt gets the highest marks among television news personalities, a Hollywood Reporter/Morning Consult poll finds. While cable news has become the medium du jour during Donald Trump’s presidency, with Fox News hosts cheering on a president who has battled CNN and MSNBC, even the most successful shows on those networks can’t draw as many viewers as the lowest-rated of the evening broadcast news shows. Cable also trails broadcast in another key metric: audience trust. According to a new Hollywood Reporter/Morning Consult survey of about 2,200 adults, NBC Nightly News host Lester Holt is the most trusted television news personality in America, trusted “a lot” by 32 percent of respondents and “some” by 30 percent. He’s trailed by two ABC News anchors: his evening news competitor David Muir (28 percent trust “a lot”) and Good Morning America co-host Robin Roberts (28 percent). Only one cable news host, CNN’s Anderson Cooper (29 percent), is considered exceedingly trustworthy by more than a quarter of Americans polled. On the contrary, the 10 least-trusted television news personalities all work for cable networks: Fox News host Sean Hannity leads the way (30 percent say they don’t trust him “at all”) followed by MSNBC’s Rachel Maddow (26 percent), CNN’s Don Lemon (25 percent) and MSNBC’s Mika Brzezinski (23 percent). Holt, Muir and CBS Evening News anchor Jeff Glor, who rarely editorialize or express political sentiments, are also seen as the three least-ideological news personalities. Overall, 31 percent of Americans trust the major television news networks “a lot,” compared to 27 percent for cable news. Cable news viewers also worry more than network news viewers (35 percent vs. 31 percent) about the accuracy of broadcasts. “I’m not at all surprised that broadcast newscasters have more credibility than cable because cable has increasingly gone to the opinionated model over the last few years,” says Mark Feldstein, a University of Maryland broadcast journalism professor who has worked for both ABC News and CNN. 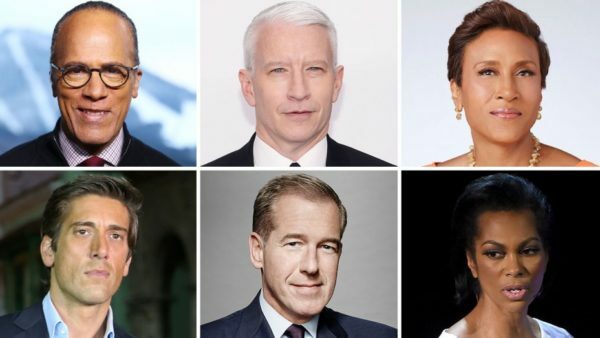 Holt, Cooper, Williams, and the rest from MSNBC, CNN, NBC, and ABC, are about as Trustworthy as putting Adrienne Clarkson or Julie Palette in charge of A Government Expense Account. Of course we would also expect a totally unbiased story and response from the Hollywood Reporter would we not? are their favourite type of story. Puppies and wild animal stories seem to show up on Global with increasing regularity in the past year. Are they shooting for a cable designation?